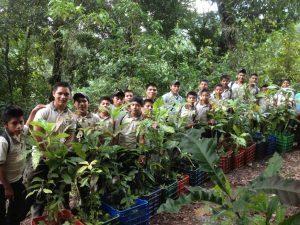 CCFC, in partnership with the senior class of Liceo Javier de la Verapaz, San Juan Chamelco undertook a major reforestation project with the village schools of San Pablo Xucaneb, Coban. The village of San Pablo is located at the foot of the Xucaneb mountain. The Resplendent Quetzal, a near-threatened species and Guatemala’s national bird, can still be found in the cloud forests of the mountain. San Pablo Xucaneb is also high priority work area for CCFC programs such as Artful Eyes, Kids and Birds, and the scholarship program. As a part of their senior project, 10 senior students from Liceo Javier made several visits to the village of Xucaneb. With guidance from CCFC, the students defined and mapped areas for reforestation. Students then met with village leaders and private landowners to agree upon a plan for reforestation. On July 6, CCFC provided 500 seedlings for the first installment in this project. Students from Liceo Javier worked with local students to plant target tree species. When finished, this reforestation and stream bank restoration project will cover 8.629 acres. In terms of overall environmental impact, maybe it is a drop in the bucket, but it’s a start. This project is also another opportunity for CCFC to reach the teachers and the youth of this village and to advocate for the long-term appreciation and protection of the cloud forest.